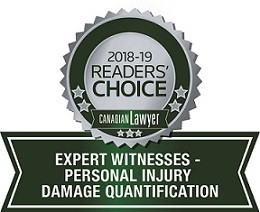 Brown Economic was voted to be the top economic expert witness firm in Canada. As forensic economists who abide by NAFE's definition and ethical principles, Brown Economic Consulting has the experience, expertise and resources to offer the highest quality in court-ready reports, quantum expert witness testimony and on-line damages calculators. Brown Economic Consulting quantifies economic damages relating to loss of income, cost of care and loss of housekeeping capacity that occur due to personal injury or wrongful death. The CBA's New Brunswick branch has donated funds to the Canadian Bar Law for the Future Fund (LFFF) in recognition of Ms. Brown's legal education services to New Brunswick's Spring 2013 Program. Cara Brown attended the University of Calgary's Master of Arts (economics) program with Canada's former Prime Minister, Stephen Harper. Ms. Brown visited with Prime Minister Harper and other University of Calgary alumni at an exclusive luncheon of his classmates in Calgary on July 9, 2012. Cara Brown was profiled in Royal Bank Of Canada's Champions newsletter, fall 2004. Brown Economic Consulting was nominated for the Calgary Chamber Of Commerce Small Business Of The Year Award, 2002 . Brown Economic Consulting has assessed loss of income using CSD/PALS/HALS research. CSD refers to the Canadian Survey on Disability. PALS refers to the Participation and Activity Limitation Survey and HALS refers to the Health and Activity Limitation Survey.